If you’re unfamiliar with granita, think of it as the crunchy version of sorbet. Granita’s gravelly texture would seem to make it the coarse country cousin of sorbet, yet somehow it manages a rude elegance, like handmade orecchiette, that sorbet can’t quite touch. Aside from the fact that sorbet often contains egg white, and granita does not, the primary distinction between the two is that sorbet is made in an ice cream machine. The machine churns as the sorbet mixture freezes, breaking the ice crystals into smaller and smaller pieces, resulting in a dense, even texture. Granita predates the ice cream machine. The basic method begins with a frozen block of fruit flavored ice, then scraping it apart with a fork. Surprisingly, this is quite easy. A subtler approach is to stir up the granita a few times during the process of freezing, then scraping this somewhat looser product after it has frozen completely. We tried both. Both work. The freezer interruptus method results in finer crystals. Your call. Here’s the scene: working-class neighborhood, first house, first back yard, first patio. Radical move against the local pave-the-yard-build-a-grape-arbor esthetic. We christened the patio’s finish by inviting neighbors Pam and Chris to join us for Grilled Spring Onions with Romesco. At the time, almost two decades ago, I’d heard of Romesco, the thick Catalan sauce based on roasted red peppers and nuts, but not grilled spring onions, which my wife assured me was a big deal in Barcelona. She was right. The Calçotada is a month-long Barcelonan lovefest to calçots, spring onions, which are then grilled and slathered with Romesco. Imagine a sloppy Falstaffian bender lasting most of April, involving untold quantities of red wine and masses of fragrant grilled onions wrapped in newspapers or served in inverted clay roofing tiles and eaten with your hands. Uh-huh, who isn’t down for that? If you tuned in last week, then you know our posts this month are inspired by Dan Buettner’s work on the Blue Zones,* specific regions of the world where people lead exceptionally long, active lives. But why live to 100 if you have to eat gruel to do it. Thankfully the cuisine of the Blue Zones is both simply and tasty. Last week we spotlighted a Sardinian Fava Bean and Almond Soup. This week our featured performer is a simple dish of Sautéed Taro and Greens, both staples of the Greek island of Ikaria. By coincidence or culinary karma BBC Radio broadcasted yet another story this morning on those frisky long-lived Ikarians. So get with the program! We’re all Ikarians on this bus. Give me one good reason why anyone would choose to cook tomatoes at the very apex of their season, especially for for four hours? 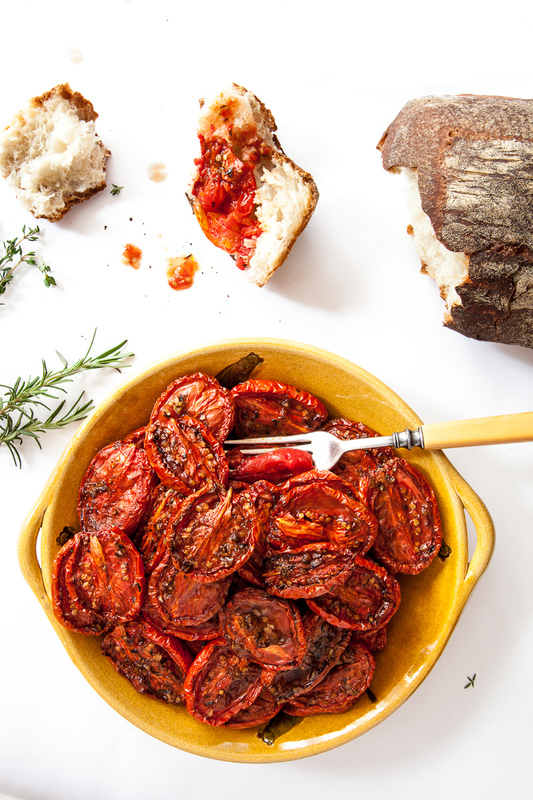 Okay, here’s one: Slow-Roasted Plum Tomatoes with Herb Salt. Plum tomatoes are the different tomatoes of the pomodoro world. Not inferior, just different. Consumed raw, their virtues remain hidden, but when roasted slowly they soften to the consistency of butter. Spread them on good bread, give them a quick chop to help them morph into a quick sauce. As a contribution to a picnic where everyone is assembling a plate of goodies, or as a high class sumpin’-sumpin’ with olives and shaved Pecorino Romano before dinner, they will provoke applause.